Here is the promised picture of Mojave. I've made a good bit of progress on it, once the bands I'm on are done there is only one more set left. 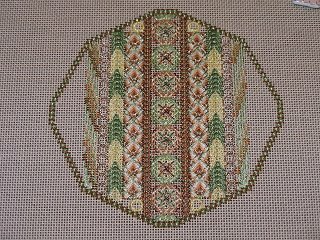 Then there are beads that will go in the Jessica stitches (the row of circles) that are a cool copper color. I would love to have this done by Monday but that just isn't going to happen as I am moving the bulk of my stuff this weekend so much of my time will be taken up with packing and un packing my collection of too much stuff. Wow, Mohave looks wonderful!! What a pretty piece.